Historical landscape and former county in the Saône-et-Loire département in the Bourgogne-Franche-Comté region, whose name derives from the city of Mâcon. It is part of the winegrowing region Burgundy, Already the Roman poet Ausonius (310-395) mentioned the wines from this area. In the 11th and 12th centuries, the monks of the Cistercian Order on a larger scale vines. The area became famous in 1660, when the winegrower Claude Brosse delivered wine to the royal palace in Versailles and there at a fair the French "Sun King" Louis XIV. (1638-1715) attracted attention for his unusual size. The king spoke to him, tasted his wine after the mass and was so enthusiastic that the royal court was regularly supplied with it. A small but important part of the landscape for viticulture is called Haut-Mâconnais. This part corresponds approximately to the borders of the former canton of Lugny with the capital Lugny. The inhabitants of the area live mainly from viticulture - either directly or indirectly. The various appellations cover a total of nearly 7,000 hectares of vineyards along the river Sâone in a 50-kilometer-long and 15-kilometer-wide strip and lie between the two areas Côte Chalonnaise in the north and Beaujolais in the south. This makes Mâconnais the largest area in Burgundy with about a quarter of the total area. Here there is also a community Chardonnay, which was formerly adopted as the "birthplace" of the same name variety. Presumably, the place was named after the vine and not vice versa. The three types of soil are clay-limestone soils with limestone scree, clay and siliceous soils on granite and volcanic substrates, as well as slippery soils. It is moderately oceanic climate with a continental tendency. About 85% of white wines are made mainly Chardonnay with shares of Aligoté and Pinot Blanc produced. The 15% red and rosé wines are made Pinot Noir and Gamay vinified. The regional AOC Mâcon covers about 1,900 hectares and applies to red, rosé and white wine. 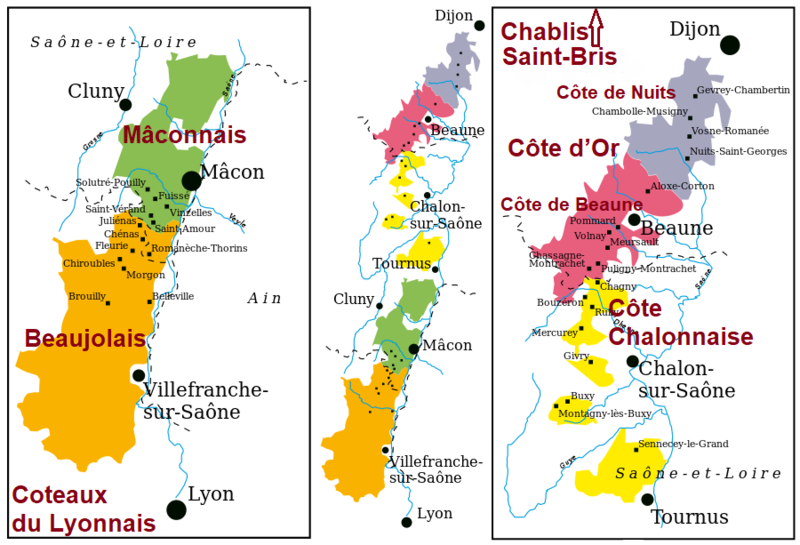 Wines from particular locations or 27 municipalities may add to Mâcon the commune name, whereby special production conditions apply with lower maximum yields. For all wines these are Azé, Bray, Burgy, Bussières, Chaintré, Chardonnay, Charnay-lès-Mâcon, Cruzille, Davayé, Igé, Lugny, Mancey, Milly-Lamartine, Péronne, Pierreclos, Prissé, La Roche Vineuse, Saint-Gengoux -le-National and Verzé. Only for red and rosé this is Serrières. Only for white wines are Fuissé, Loché, Montbellet, Solutre-Pouilly, Uchizy, Vergisson and Vinzelles. The AOC Mâcon Villages covers 1,400 hectares of vineyards in 80 communities and applies only to white wines. currently 128 284 Wines and 22 902 Producers, including 1 344 classified producers.